A powerful earthquake struck Taiwan today, causing damage and a partially collapsed hotel building, sources report. The USGS reports that the magnitude 6.4 quake struck 21 kilometers (13 miles) north of the city of Hualien at 10:50 U.S. Eastern Time, at a shallow 9.5 kilometers (6 miles) below the surface. No tsunami warnings have been issued. 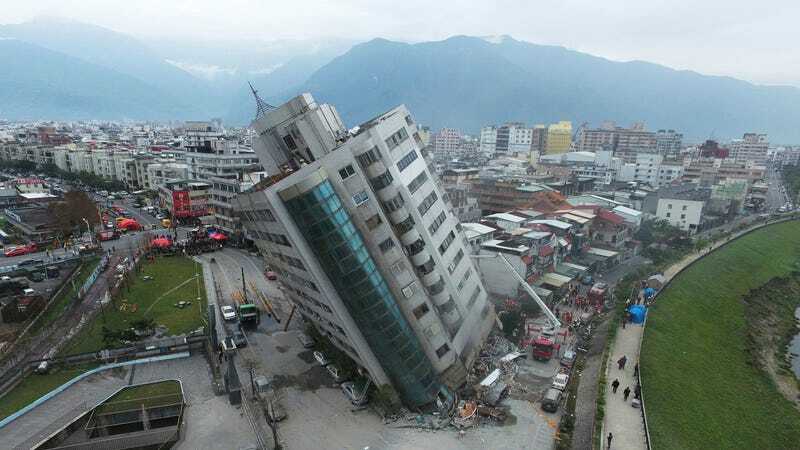 The English-language Taiwan News and the BBC report that a number of buildings have collapsed in Hualien City, including a roof of a hotel. There are no reports of injuries yet. Residents as far away as Taipei (around 120 kilometers (75 miles) north) could feel tremors. This is the second powerful earthquake in the area in just a few days. A magnitude 6.1 earthquake struck in nearly the same spot on Sunday (Monday Taiwan time). Taiwan’s location on the geologically active Pacific Ring of Fire means they’re no stranger to tremors. Many of the country’s buildings are built to withstand some shaking. This story is developing. We will update the post when we know more. Update 2:30PM ET: The BBC reports two confirmed dead and at least 100 injuries. Some are still trapped inside of the half-collapsed hotel and are shining the flashlights on their phones so responders know they’re there. 28 have been rescued from other collapsed buildings. Today’s quake occurred on the second anniversary of another that killed 117 two years ago. Update 2/7/18 10:15AM ET: USA Today reports the death toll is up to six. There are power outages and water has been cut to thousands of residents. Reuters reports that 60 are missing. What Are Those Mysterious &apos;Earthquake Lights&apos; Popping Up on Social Media?